Thank goodness last week is behind me. Thanks to all of those who made sweet comments about my Diet Meltdown….I read every single one and they were helpful. 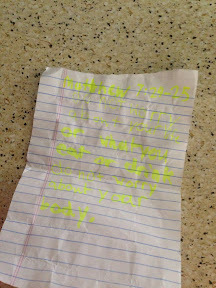 My nephew gave me a sweet note after church that might have been just what I needed…. Sometimes those are the best little messages you can get. I wish my meltdown had not affected my entire week like it did but I am hopeful that it is behind me now. I think I needed that breakdown so that I could get my focus back on track. My focus has never really wandered, just my sanity and ability to think clearly, but like I said, I have a laser focus now and back to the grind. I have done some research and am trying a new thing. I always say “new” like its new but just a changeup. I am really doing the same thing as before but following a new plan. It’s called Carb Cycling and it’s really not new in the world of dieting. I have always adjusted my calorie intake from day to day so that my body doesn’t plateau and this is similar but instead of just up calories one day and lower calories the next it’s a High Carb day and Low Carb day with the same cheat day that I get every week. I have to pull the reins in on my cheat day because that had become a free for all and that has to be tamed. I like to try new things all the time and this is nothing drastic, just something new. 1. I started drinking out of a smaller bottle so I have to get up way more often to fill up my bottle. 2. I am now chewing gum every time I get in my car to keep me from eating in my car. 3. I am only using www.myfitnesspal.com to count my calories and no longer using the other variable counters cause I’m pretty sure that is what caused the nervous breakdown last week. Now that I have my mind wrapped back around my diet and I am much less anxious about it I was able to really focus on my workout this morning. I got to PUMP class this morning and got in a great burn then took it to the floor for a few more cardio exercises and some additional legs workouts. I managed a pretty good workout and still had time for a steam and managed to get to work early! Work was pretty tame for a Monday and you get no complaints from me there. I can always use tame every now and then, tame but busy! Busy is also a good word to use on a Monday! All in all , work was a pretty good day! After work I had a ball game and several other errands to run before I could even think about another workout...and unfortunately that never happened. I got to the game and then cleaned the office and packed up all my stuff for tomorrow and by the time I got all that done it was after 9pm and I needed to get to bed. Im not quite done for the night so please come back and check out the next post, Im super excited about this so I cant wait for you to see!